OF THE 345 players Mick Malthouse has coached at senior level, few can lay claim to a story like the one of John Riley. The South Australian's one and only game of VFL football came in Mick Malthouse's first game as coach. Recruited from North Adelaide and good enough to play for his state, the 25-year-old became caught up in the tension that existed at the time between South Australian and Victorian football. Footscray wanted him. North Adelaide, a club he had captained and was contracted to for two years, didn't want to give him up. The Roosters would eventually take his case to the Supreme Court to stop him from playing in the VFL. But they could not deny his moment under Malthouse. After playing a few trial games for Footscray, Riley was selected to play in round one. But it was no easy passage to his debut. Still completing his PhD in Atomic Physics at Flinders University, Riley had been commuting between Adelaide and Melbourne. On the day before round one he sat in a lawyers' office in Adelaide while others debated whether he could play for the Bulldogs. The focus of much attention in his hometown, his case divided opinion. As soon as he got the green light he could play in the VFL, he jumped on a plane to Melbourne and headed to a hotel in Carlton. "Mick gave me a call with some instruction about who I would be standing [the next day] that night," Riley told AFL.com.au. "It was all a bit rushed." Malthouse told Riley, a talented centreman who knew how to win the football, he was playing on the wing. He then gave him some information about his relatively new teammates and that was that. Riley knew the club's general manager, Shane O'Sullivan, a long-time friend of Malthouse's who will share the record-breaking game alongside him on Friday night, reasonably well. It was O'Sullivan who had done the work to entice him over. He was also comfortable with the coach having struck up a relationship with Malthouse, spending a day at the MCG watching the cricket with him and meeting him regularly. "I found him very easy to get along with and very pleasant," Riley said. He didn't know Doug Hawkins, Simon Beasley or his other teammates that well but he has never forgotten how much they welcomed him and made him feel part of the club. Riley sensed he was moving into a more professional space on game day as he put the No.26 Footscray jumper over his prematurely greying hair. He also sensed that Malthouse was something special. "You could sort of tell with Mick he sort of had a presence about him even at that point," Riley said. "He was still pretty young, I guess, but you could tell everybody took notice of what he said and where he walked in the room." Malthouse's first game as coach went well. Beasley kicked 11 goals and the Bulldogs defeated Richmond by 39 points. Riley had four kicks and four handballs. His memory of the detail is not strong but his recollection of the emotion is vivid. "I remember a few incidents, like running along the wing there trying to catch a Richmond player, I forget who it was, and not having much success," Riley said. "The win was fantastic. That was a big deal and I remember afterwards lot of enthusiasm around the place [after] Mick's first game. You could really see they were trying to create something at Footscray." Unfortunately for Riley he was to be denied the chance to be part of it. The South Australian Supreme Court awarded North Adelaide an injunction blocking Riley from playing in the VFL. On the eve of the decision West Adelaide coach Neil Kerley reflected the stalwart's mood. "It's a flagrant disregard for the rules. The Victorian football administration doesn't care one iota about the welfare of football in Australia. They're only concerned about football in Victoria," Kerley said. Justice Robin Millhouse banned Riley from playing football for Footscray on Saturdays, Sundays or Mondays and from playing if North Adelaide was playing on any of those days. He was also banned from playing on two successive days, effectively ending any hope he had of kicking off a VFL career immediately. "A strange decision, a hometown decision, but that was the way it went," Riley said. Footscray wanted to continue the fight but Riley decided he had had enough. "By that stage it was taking its toll. I had reporters outside of my house, as it was a big story in Adelaide," he said. That week he was in North Adelaide coach Mick Nunan's office and played for North Adelaide on the weekend. 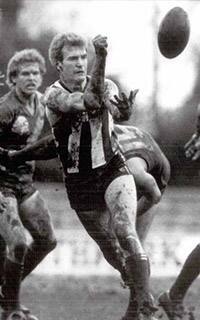 He went on to play 250 games, be named on a half-back flank in the Roosters' team of the century and play in the club's 1987 premiership. The Bulldogs kept at him however, inquiring over the next few years as to whether he would consider a move but by the time that contract ended he was 28, had a job and was settled again. "I was thankful for the opportunity but the way things were turning out it didn't seem like it was going to work out. [They (Footscray) were] a great club that made me welcome," Riley said. That same man is now Dr John Riley, 57, an atomic physicist with a senior position running a division in the Defence Department. Married to Dianne, with three children, Alexandra, Katherine and Andrew, he knows his time at Footscray was a sliding doors moment. As Malthouse ploughed on for 31 years and 714 games, Riley took another path. His career took him to Canada, to the embassy in Washington where he was the Defence Science Attache, and then time in Western Australia working on a submarine program. He is now living in Adelaide, working for defence as chief of the weapons and combat division. "We have had an interesting career and life and the family has enjoyed the opportunities that has provided," Riley said. He has no regrets and his fondness for Malthouse is genuine and heartfelt. "You could tell he was really going to do something in the game, just his persona that really made people want to listen to him but other than that you could tell he really cared about his players," Riley said. "I found him a great guy to talk to and very easy to communicate with." He laughed in surprise when told of Malthouse's lightning response when Riley's name was mentioned this week as the 61-year-old left AFL House. "Ahh, Riley, South Australian," Malthouse said. Alongside each other the day it all started for one VFL/AFL legend. *Riley is one of 1080 people to have played one VFL/AFL game only.